Ron and Lynne Pulley say they were looking to receive more than a paper account statement when they sought a place to invest during retirement. They wanted something with more substance. "Where are we going to put this where there is a chance maybe it would grow a tiny bit?" says Ron. "We looked at the economy, and I worked in the economy. I suddenly realized the days of the 5 percent CDs were coming crashing to a halt." They wanted a safe investment but also wanted growth. "We got to looking at who is successful in this world," he recalls. "Are we going to trust the corporations? Probably not. Trust the government? Probably not. But we looked at land-grant universities and realized the commitment that has been made to land-grant universities over time and suddenly realized if a land-grant university fails, chances are there is not a whole lot left in this world anyhow." 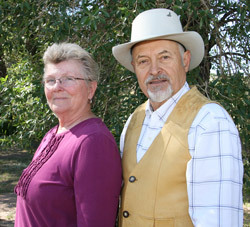 The couple created the Seneka Graduate Assistantship in 2008. More about the name a little later; they say the relationship with UW is symbiotic – they get a return in excess of what they would in other investments, and another facet of living was brought into their life. "It opened a whole new realm of social activity," he says. "Instead of getting a quarterly report, we have a body that is there and has a scholarship to conduct graduate work with (Professor) Dan Rule in animal science. We then have this whole social aspect to what our money is doing. It's not just stagnant. It's a body we can be introduced to, have lunch with, we can learn what the person's life is, desires, what he or she would like to do made possible by the funds we provide." This year's recipient is Emily Melson of Magnolia, Arkansas. She is working with Rule on fatty acid supplementation schemes on grass-fed steers. and the last portion and with Associate Professor Warrie Means on the impact of the fatty acid supplementation strategies on meat product composition. The social aspect of their investment happened when the Pulleys were introduced to Melson by Professor Doug Hixon, head of the animal science department. They had lunch. Talk to the couple about agriculture, and sustainability pops up a lot. His definition of sustainability isn't about having inputs equal outputs. It's a generational thing. "The eastern Indians, the Iroquois, Senecas, Mohawks, when they talk about sustainability, they are talking the seventh generation, which is probably 450 to 500 years in the future," he notes. "They are trying to live their lives for the seventh generation. This is how you perpetuate these things – always looking ahead. What can we leave that will not only be a legacy but will be there 450 years from now?" The assistantship is for a graduate student studying food and nutrition but there is freedom given to pick the best candidate if there any changes in programs. "We wanted to make it not so difficult for them to shift gears and use it appropriately," says Lynne. The name? The Pulleys say they didn't create the assistantship to have a legacy for their name. They just want it to help a student's career. Seneka was their much-loved poodle. "A very exceptional dog," says Ron. "She was a special animal to us."